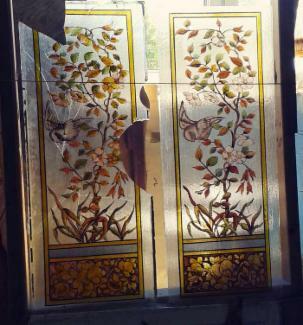 A victorian style stained glass window to match the existing windows for this home. The panel on the left was built in 1900, the panel on the right 2005. The colours and textures of the glass match as close as possible. 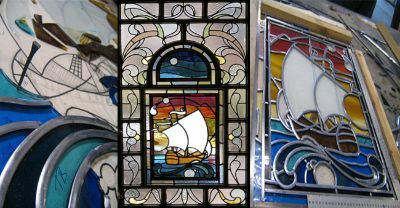 The panel is constructed in the same manner as the original and with secondary glazing of laminated glass to protect and add saftey to the home the new window will last at least 150 years before it may need some repair to the lead. 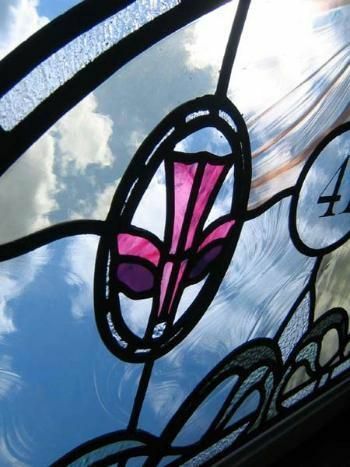 The design for the stained glass fanlight used architectural details from the clients house and garden. Fleur de lis, Stars and Scrolls. The panel on the right incorporates a tile design from the stairwell "wally close" of this clients tenement home. The logo for the Scottish Wooden Spoon Charity was incorporated into a stained glass window to thank the charity for a donation in helping build housing for disadvantaged children in Glasgow. Formally opened on 10th June 2005 by Scottish Rugby Internationalists John Beattie and Donnie MacFadyen. 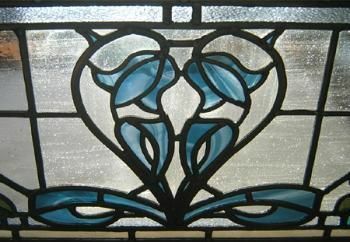 Stained glass door panel detail of heart shaped glass. A stained glass entrance hallway with red heart motif and clear textured English Muffle glass. 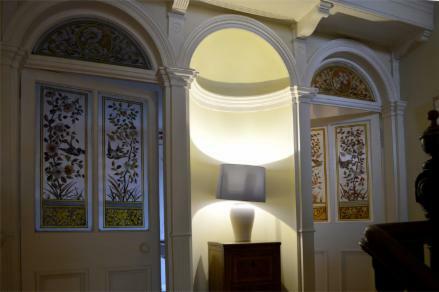 The designs used in the new windows were based on the existing stained glass within this Newlands home, Glasgow. Dumbarton Rock. Stained glass window reproduction. To build up the picture and to fix the paint to the window the panel is painted in stages where each stage is kiln fired. 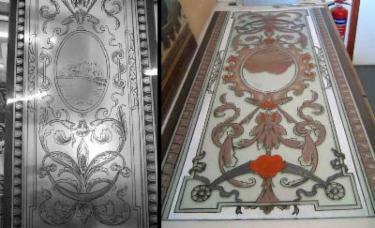 The pictures show the tracing, the shading and the final silver stain stage. In situ Bird, Tree and Pomegranate stained glass window. 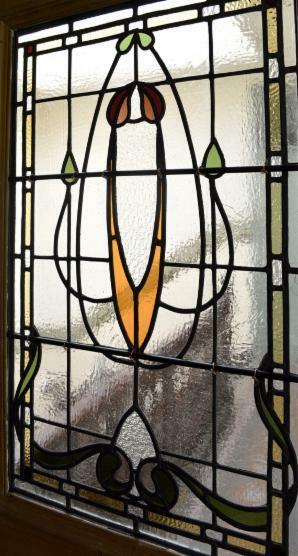 Reproduction of 1 of 4 windows for this Dowanhill home, Glasgow. 1874. Bird, Tree and Pomegranate stained glass window. 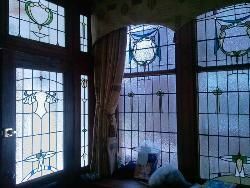 Reproduction of 1 of 4 windows for this Dowanhill home, Glasgow. 1874. 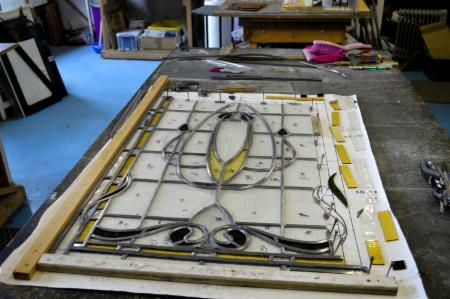 A leaded stained glass window being constructed. Horse shoe nails hold the glass and lead in place until the lead is soldered to permanently fix the glass. A new Glasgow Style stained glass window for a front door in William McNicol Whyte's 1902 Baronial west end tenement (with motifs such as turrets with projecting canons, strapwork, thistles, shields, canon ball finials and lengths of cable along its frontage) at Broomhill Drive, Glasgow. Glass used ... Bullseye Glass Co. The Paul Wissmach Glass Co. Spectrum Glass Kokomo Opalescent Glass and a wee bit of LambertsGlas - Glashuette Lamberts Waldsassen, Germany. Stained Glass Page 1, Page 2, Page 3, Page 4, Page 5.